Jointer-Planer 310 mm (12") Planing width, Motor power 4.0 HP (3.0 kW) S6/40 % | 1 x 230 V, 60 Hz. 12" jointing and planing width for outstanding results that will impress even the most discerning woodworker! The 3 knife quick-change, self-setting cutter-block system enables simple and accurate planer-knive-changes in seconds. For jointing and beveling work the jointer fence tilts from 90°–45°. The long jointer fence profile allows accurate guiding of the work-piece. With table extensions you can achieve a really extraordinary table length so that you can work on large and heavy pieces without help. 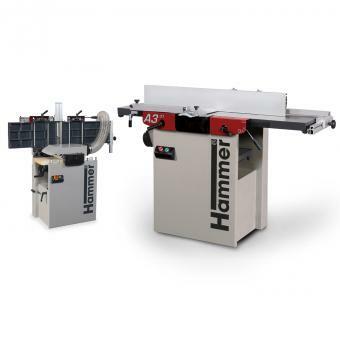 The jointer removes material up to 5⁄32“ (4 mm) in a single pass.